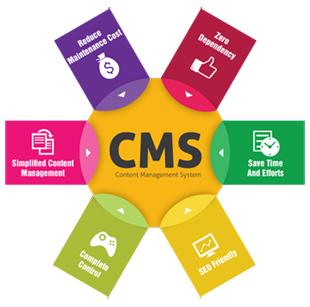 A CMS or Content Management System is used for controlling and editing of content. This content includes any kind of files, it may be an audio, video or a flash file or any document. The main concept behind a CMS is to make these files available for updating or changing the contents. A CMS is often used for collection of these documents as well. Many companies use a CMS to organize and store files in public form. Companies using a CMS can share content with others easily, as most systems are server based. CMS allows website owners / operators manage the content of their website without having technical or operational knowledge of computers. A good CMS allows non-technical authors and editors to publish their content easily and quickly. Best Content Management Systems (CMS) allows a user to create and manage an unlimited number of pages on a website and control functionality of each such page. Easy to Use: Simple interface is easy to learn and is productive to use. Choice of WYSIWYG editor: Users may choose to edit content using various options available to them according to their criteria. Alternatively advanced users can directly edit the HTML snippets or can copy and paste it from any other applications such as Word or Front Page. Rich Multimedia Support: It supports formatted files such as .pdf,. doc,.xls etc or any image, video or audio files. It has an ability to assign certain roles and rights within the document management system and across differing content types and categories. Ability to record, track and manage many versions of the same content or files - a document management system with versioning. Ability to publish content to a centralized content archive, to facilitate greater access to the content. More importantly with time, this repository is a vital element of the CMS system, and incorporates search and retrieval methods. Quad SoftTech offers state of the art content management solution for websites, nowadays everyone wants to handle their website by themselves; we have made CMS to give utmost freedom to user to maintain their website. CMS contains the user friendly well designed panel which can be handled by any beginner or non-technical user on the web.